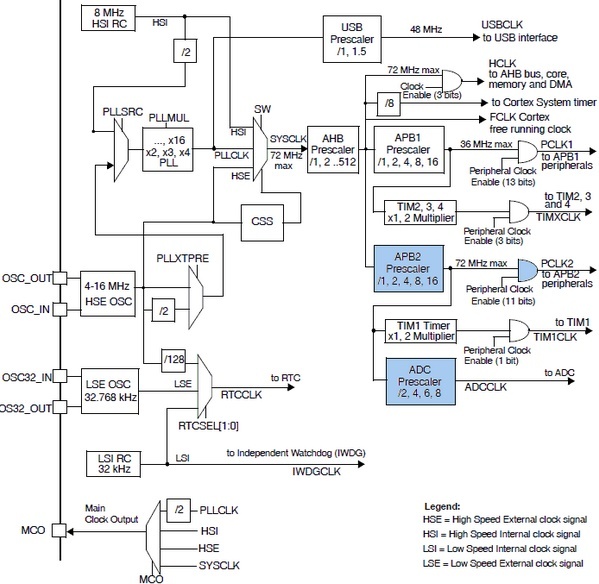 Shown below is the STM32F10x clock tree. Notice some areas are highlighted. Check them out because these are related to the ADC block. We can clearly see that the ADC peripheral is connected to the APB2 peripheral bus. If you can recall from my earlier post on STM32’s clock options then you’ll remember that APB2 can run at 72MHz speed which is by the way the maximum operating speed for STM32F10x series MCUs. ST recommends that the ADC be feed with no more than a 14MHz clock. Thus we should make sure that ADC clock is in the range of 600 kHz to 14MHz. Since it takes about 14 cycles to process ADC data the maximum possible number of conversions per second is one million. 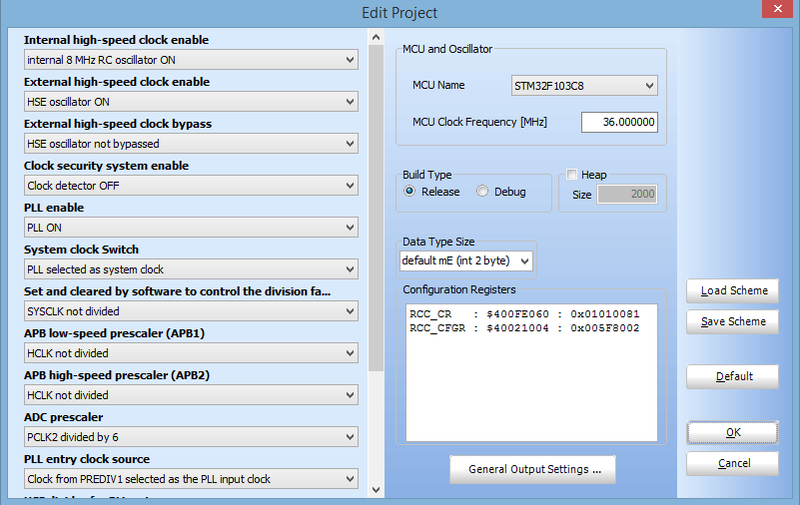 I previously pointed out in one of my posts that MikroC’s IDE provided an easy to use tool to configure clocks for various STM32 peripheral buses. I recommend using this tool to configure peripheral clocks rather than coding them on your own. 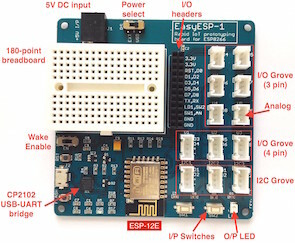 Pay attention particularly to APB1, APB2 and PCLK2 clocks when setting clock for the ADC block. Wrong settings will lead to unpredictable/erratic behaviours. Additionally you can use STM32CubeMX to verify if your clock configuration is okay. You can also use this software to check which I/O pins belong to which ADC channels and much more. However be aware, STM32CubeMX is not yet compatible with MikroC compiler. Personally I rarely use it. There are several registers associated with each ADC unit. At first you may feel like getting lost in an ocean of 32-bit registers. However things aren’t so. Of these there are two ADC control registers called ADC_CR1 and ADC_CR2 that set ADC properties and mode of operation. There’s a status register, ADC_SR which flags important ADC events like end of a conversion, etc. These are the most important ones. I’m not going to explain every bit because they are well explained in the reference manual. The next set of registers are responsible for specifying channel sequence, sequence length, sampling times, offset and holding ADC conversion results. 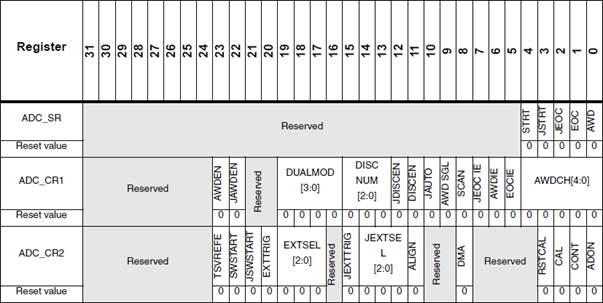 While dealing with the STM32 ADC block, you’ll come across the letter J before many stuffs. These stuffs signify that they are related to inJected group channels only. The rest of the stuffs are mostly related to regular groups and common uses. ADC_SQRx registers specify channel sequences. There are three of these registers and of them ADC_SQR1 also specifies the number of channels in a regular sequence. ADC_SQR3 through ADC_SQR1 are sequentially feed with channel numbers according to position in a given sequence. The injected group equivalent of the ADC_SQRx is the single ADC_JSQR register. ADC_SMPR1 and ADC_SMPR2 registers specify the sampling times of each channel. The sampling time is common to both regular and injected groups. ADC_LTR and ADC_HTR registers hold the lower and upper analogue watchdog ADC count limits respectively. Again these are common for both groups. ADC_JOFRx registers hold offset values for injected channels. The values in them are automatically subtracted from injected channel ADC conversion results. Lastly the ADC_DR and ADC_JDRx registers hold ADC conversion results for regular and injected groups respectively. ADC_DR is common for all regular group channels. There are four ADC_JDRx registers for four injected channels. Recall that there can be up to four ADC channels for an injected group. When coding there’s no need to follow any specific sequence for programming registers. Just make sure you coded for the required ones correctly. Now you can see that you don’t need to handle 32-bit registers, bit positions and possible combinations of bit values. In fact sometimes you won’t have remember the names of registers at all. All of these things are replaced with something more meaningful and easy to understand. Unlike ST’s SPL you don’t even have to be a programming wiz to use these libraries. Please check the header files for better understanding. At this point I must specify that I single headedly developed this idea and the libraries themselves. It took several months to develop, code, test and implement them. I tried my level best to keep things error-free and as per reference manuals. There could be some unintentional flaws in them. Should you spot one please notify me for correction.